We have created ResearchResult as a management and advisory tool for research facilities. This cloud based solution combines both the daily farming practices as well as the trial and research aspects of the research centre into one integrated system and can be used for pigs as well as for poultry- both layers and broilers. ResearchResult offers you a complete integration of various data streams, that are collected through automated process equipment, manual data input via the App and through connection to ERP’s. The data is not only gathered in various ways but also covers multiple on-farm topics such as: animal & production environment, health & disease control and profitability & productivity. Besides, it includes supply chain data (full track & trace) and covers all functionalities that a research farm requires to conduct and evaluate research. ResearchResult is a combination of the IoT Cloud, our Management Systems and our Trial system. The core of all our solutions is the IoT Cloud. It connects to IoT devices (=process equipment) within the houses and organises real-time farm data in a dashboard with a multiple location overview. This dashboard can be set with your personalised targets and compares the planning to the actual situation. This is done for multiple locations and houses, this makes it possible to look into several house at the same time and compare their current situations among each other. The IoT Cloud offers you early-waring alerts to prevent risks from occuring. The various roles of authority create the right visual and authorities for the right user. The IoT Cloud can be connected to other systems such as feed optimisation systems or can be upgraded to merge with management systems. Our management solutions are a broadly extended form of the IoT Cloud. The IoT Cloud functions as risk preventor and for monitoring & control. Besides that, the manual data input option is combined with supply chain data and integrated into a management programme suitable for individuals up to integrations. These cover complete management aspects of your farms that always result in key technical and financial KPI’s, including connection to for example data such as feed deliveries, slaughterresults and genetic background. The idea is to create more value with data through benchmarking, analysing and sharing it. Our hierarchical data sharing option offers you as data generator the option to decide which data to share with whom. ResearchResult sets-up trials and hands the opportunity to compare multiple trials among each other. Essential is that it provides full track and trace from genetics/insemination to slaughter, because all phases in the livecycle are recorded and centrally allocated. These trials are done under a Standard Operating Procedure (SOP) assuring the most efficiënt and uniform way to gather data and also to record observations. The planning calendar helps to understand which tasks need to be performed at what time and the audit trial registers who has been executing certain tasks, making it possible for others to view the fulfilled and still to-do tasks. There is also a hierarchy in different user groups. Both technical as well as financial results are delivered in the form of data reports and KPIs. The analysis of this data is made more easy with flexible reporting opportunities. Combining all three elements into one solution delivers a total overview of your pigs and poultry in your research farm. The IoT Cloud offers continuous monitoring & control and therefore functions as a risk mitigator for automated processes in the houses like climate, water and relative humidity. The management system connects all this data to supply chain data to easily see the automated feed deliveries or automatic slaughterresults. These are essential in understanding the farm status of your animals. Besides that, ResearchResult offers complete track and trace from sows, piglets and finishers to rearing, hatching, breeding, broiler. Also offering detailed data records for trials and research. Detailed data can range for pigs anywhere from breed, trial worthyness, expected farrowing day up to back fat thickness, manure score, relocations and treatments. 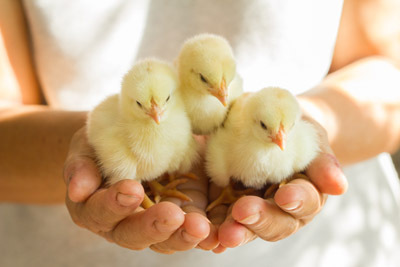 Also for poultry details such as the DOC amount, the age of the mother animals, breed, feed, water, weight, a wellbeing log, litter and automated slaughterresults are recorded. For layers, this is data like for example: mutations, egg countings and egg weights. Of course, including additional house data like relative humidity, CO2, light and climate. Copyright © 2019 FarmResult Netherlands, all rights reserved. Please consult our privacy statement here. Website design & development by Klyck.